The Thai Government says that tap water in Bangkok is safe to drink, and as far as I know, I have never had any trouble with it. But I have always tended to stick to bottled water for my drinking and my cooking. But buying plastic jug after plastic jug of water that will end up in a landfill somewhere is not very environmentally responsible thing to do. So for a long time, we have been filling up empty jugs with water at water stations like this one. They are all over Bangkok, and for only 1 baht per liter (10 cents per gallon), you can have supposedly clean, filtered water. But it was a hassle to remember to take the empty jugs to the gas station, fill them up, then lug them back to the house. And who knows how safe the water really is? So now we are getting Sprinkle water from a company called M Water. They started us off with three 5-gallon containers of water and 24 coupons redeemable for full containers. Every week, we put the empties outside our door with the appropriate number of coupons, and they stop by to collect and replace them with full ones. The price is a little bit more than the water stations, but the free delivery and quality assurances make it a great deal in my opinion. Delivered by M Water Co.
For my long bike ride this weekend, I decided to try a route recommended by someone on The Klong Cyclist website. The site said that there was a good walkway along the Saen Sap Canal that would take me to a few lakes in the Seri Thai area. Then, on the way home I could take some back roads behind Ramkamhaeng and avoid the busy roads in this area. I decided to do an afternoon ride this time, and unfortunately that meant that I didn't get to explore as much as I would have liked to, as I ran out of daylight. But on the other hand, I didn't have to get out of bed at the crack of dawn! The pathway along the Saen Sap canal turned out to be a great one. It's about 2 meters wide and goes for about 4 kilometers on both sides of the canal, from Ramkamhaeng Soi 29 to Soi 107. And other than a few stray dogs and small children, it was mostly obstacle-free. It also gave me a chance to see some interesting life along the canal, including lots of temples, including an Islamic mosque and a Buddhist temple almost next door to each other. Not to mention, it is much more peaceful than riding on Ramkamhaeng! The park was open for public use in 1987. It was the flood prevention project initiated by His Majesty the King Rama IX. Once known as Bueng Kum or Beung Tathong, the vast public reservoir was renamed to Seri Thai Park in honor for the Seri Thai or Free Thai movement on the occasion of the 52nd anniversary of the end of World War II. The park covers an area of 350 rai (about 140 acres). One part of which is allocated for the Creation of Bangkok Forest Park as a commemoration to His Majesty the King Rama IX's 50th reigning anniversary. The forest park consist of 3 parts, namely Thaimisuk, Rom Sai, and Charoenkan, all of which are partly planted with perennial plants and partially allocated for flower and fruit tree gardens, with both Thai and foreign species, as well as an island pavilion. I then headed over to find the back roads off of Ramkamhaeng Soi 118. But before I did, I stopped for some dinner. The first thing on the recommended menu at the restaurant where I stopped was grapaow blaa, which I read as gapraow blah, or basil fish, and which sounded delicious! But instead, the grapow blaa came -- a bowl of fish stomachs! So let's review the Thai language lesson of the day: gRa-paow = basil, ga-pRaow = bag or stomach. The full name of the dish was gapraow blah nam daeng. The nam daeng part means "red liquid/sauce", and since I wasn't familiar with this term, I really had no idea what I was getting. But it turned out to be pretty good. The fish stomachs actually don't have much taste, and the "red liquid" is really a thick brown gravy with mushrooms. A handful of shredded crab and some green onion was thrown on top. Not bad at all! But after that mistake, it didn't get much better. The sun was going down, and I proceeded to get myself lost down the labyrinth of Ramkamhaeng Soi 118. I ended up having to backtrack out to the main road and head home. (And busy Ramkamhaeng is not a very fun road to bike on!) But I'll definitely try this route again and see if I can figure out how to take the back roads next time. Small Talk: Conversations about living in Thailand and learning the Thai language. Entertainment: Useful words and phrases for going out, and for watching TV and movies. Business Around Town: Going to the gym, the spa, the post office, and getting a haircut. Time Chapter 2: These lessons build on the time lessons in the first course and cover being on time, setting time for meetings, and expiration dates. Eating Chapter 2: These lessons build on the eating lessons in the first course and cover different types of meat, vegetarian food, breakfast, and late-night snacks. Adjectives: This course also includes some vocabulary lessons which teaches about 70 very common and very useful adjectives. The 40-lesson Conversation Course 2 has the same low price as the first one: US$14.99 or 499 Thai Baht and it can be purchased on the ITS4Thai website. Just log in at http://www.its4thai.com and go to the "Courses" page. Yesterday, we invited our students who have gone through previous courses on our site to try the new course, and the response has been great. I am very glad to see that a lot of people are still using ITS4Thai to learn the Thai language. This year I have been doing my best to follow a new diet to lose a few inches off my middle. The main key to this diet is to avoid grains as much as possible. That's a pretty big change for me, as it means no rice, no noodles, no Au Bon Pain croissants, and no beer. I'm not sure which of those I miss the most. But even though it's been hard to stick to the diet, it has definitely made a positive difference in the way I look and feel, so I am going to keep it up for now. One of my favorite Thai foods (or, food that is available in Thailand) has always been noodle soup. Since I am not eating noodles now, I just get the soup, with pork and veggies. The pork is often moo daeng (red pork) and the veggie is a bitter, green leaf that tastes similar to spinach. The way I ordered it today was gao lao sai moo daeng. This was my lunch today, and set me back 40 baht (a bit over US$1), including a bottle of Pepsi. Hillary Clinton is traveling through Asia this week in her first over seas trip as the Secretary of State. She has been in Indonesia for the past couple of days, but Thailand isn't on her list of places to visit. Apparently, someone at the Bangkok Post got their feelings hurt over this "snub". Many in Thailand, which has 175 years of rock-solid support and harmony with the US, feel the new leadership in Washington is turning its back on an old friend. Singaporeans and Filipinos have said much the same. The new administration maintains it truly wants to focus on our region. It is important to include wary countries like Indonesia in the dialogue. But it is vital not to ignore old and trusted friends. Indonesia is one of Asia's most dynamic nations, where human energy and aspiration combine to help lead the country to a free and fair system of elections, a free press, a robust civil society, and a prominent role for women in the Indonesian Government. We will support Indonesia and other countries in the region that are actively promoting shared values. So when Thailand is "actively promoting shared values" like a "free and fair system of elections" instead of coups and mob rule, a free press instead of an environment where people fight over control of the media, and the protection of human rights instead of setting immigrants adrift on the ocean without food or water, then we'll talk about being trustworthy. Every day I want to: exercise, follow my diet, and study Thai. Every day or two I want to: write a blog post. Exercise every day: In the last 14 days, I exercised 12 times. Score: 85% Not Bad. Follow my Diet: I think I did pretty well on this one. I only remember two days that I totally went off it (beers after one long bike ride and lots of fruit at the floating market). So I'll give myself a score of: 85% Not Bad. Study Thai: Just in case you think that I am rockin' in the self-discipline department, I only studied Thai 4 out of the last 14 days. Score: <30% FAIL. And for writing blog posts on "most" days, I posted 10 entries for the last 14 days. Score: Not Bad. All in all, I'm pretty happy. I can actually see some of the inches melting off my middle, which is good. But I don't speak Thai any better, which is bad. So there's room for improvement! However, the improvement will probably have to wait a couple of days, as we're heading to Phuket tomorrow. The main purpose of the trip is to look into some business opportunities, and part of the trip is to use a free hotel voucher I won in a raffle last year. But I am sure we will fit some quality beach time in there somewhere. I knew that there were many banana varieties, but I have never seen them all together in one place: some large, some small, some all stuck together in one big clump. It's too bad I don't actually like to eat bananas. It's Sunday, so that means it's time for another long bike ride with Chris. The main point of today's ride (other than the usual exercise and exploration) was to visit the home of my friends Stephen and Jit in Phra Pradang before they head back to the US this week. Ronald McDonald gave us a good luck wai as we started our ride at J-Avenue on Thong Lo and headed towards the Chao Phraya River. We then turned to the south and rode along the river on Thanon Rot Fai Gao (Old Train Road) to the Sanphawut Pier, and then crossed over to Phra Pradang on a ferry. We then made our way over to the small community that Jit's family has lived in for generations, and had a very nice chat with them. On this trip to Thailand, Steve and Jit did a "Holy Tour" of India and visited where Buddha was born, where he died, and where he gave particular sermons. They then went on a Buddhist tour of Laos. And Jit even ordained as a nun for a while. So it was very interesting to hear of their adventures over the past several weeks. 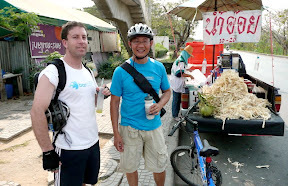 After our chat, we were feeling pretty good, so we decided to take the long way home: Through Pra Pradang, down Rat Burana to Charoen Nakorn, then over the river at Sapan Taksin and then Sathorn to Rama 4 and back to the Thong Lo area. It was a total of almost exactly 50 kilometers. Whew! The good news is that I feel much better after this week's ride than last weeks, so maybe my exercise regimen is starting to pay off. Welcome to the new look of SGTowns.com. This morning I upgraded to the newest version of Moveable Type, the Content Management System that runs this website. I decided to junk the old "look and feel" and upgrade to the default look that comes with the CMS. As I said a few days ago, I have been looking forward to this new year for a new start in life. And so far, it has been going very well. I feel like I am back on track and back doing the things that are truly important to me. So it's fitting that the online version of my life is getting an new upgrade too, both in the way it looks up front, as well as a behind the scenes improvement to a better publishing platform. Fixing the Notifications: If you get email notifications whenever this site is updated, hopefully that is now working and you will get an email with this post. With all these changes, the new version should give me some additional functionality that will make visiting this site easier and maybe even more fun. For example, you can now reply to individual comments, and you can subscribe to comments on a post so that you can see if anyone else commented after you. All of the journal content from the old site should still be here somewhere, but let me know if anything doesn't seem to be working as usual. My photo albums are not up at the moment, but I will see if I can't get those back online next week. So... we'll say goodbye to the old blue look shown on the right. I almost feel like I am waving good bye to a friend. Many hours were spent in its creation and modification, and it served me well over the years. But technology marches on and we have to run to keep up.